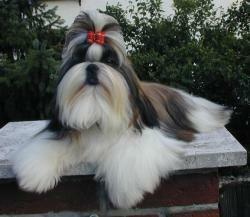 The Shih-Tzu is one of the most common small breed dogs that we see around. They are short in stature, have small floppy ears, large eyes and a short muzzle. There coat is dense and requires frequent grooming. They are prone to disc disease because of their longer backs and short legs. Also ear infection, eye problems and early dental disease can be found in this breed, along with breathing problems due to their short snouts. The Shih-Tzu was first thought to have come from China in the 1920’s where they were later sent into England and became a very popular breed in the 1930’s. During World War II the American soldiers brought them back to the United Statees with them. They were final recognized by the AKC in 1969. The Shih-Tzu is a very lively dog. They are very playful and spunky; this affectionate dog likes to be with people and are generally good with other pets. They must have rules set for them or they will take over your home and become snappy if they are suprised or peeved. Because they are small they can develop small dog syndrome; where they believe they are the boss of humans and other pets in the home, or those they come in contact with. This may cause behavioral issues like separation anxiety, guarding, growling, snapping and even biting. They may become untrustworthy around small childern and sometime adults.